Tin Mountain Conservation Center is a 501(c)(3) non-profit providing education programs that foster greater awareness and understanding of the natural environment for school children, adults, and families. Since it was founded in 1980 by Barbara Rockwell Henry and David Henry in Jackson, NH, the Center has offered hands-on programs in the schools, at summer camps, and within communities throughout northern New Hampshire and western Maine. Teacher/Naturalists devote classroom lessons and field trips to the many rivers, ponds, forests, mountains, and special natural areas that cover the region. The Nature Learning Center in Albany, NH is our headquarters and boasts solar electric and solar thermal energy, local woods and craftsmanship, as well as many innovative environmental education programs. 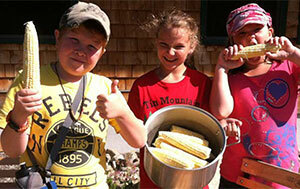 Many activities also are based at the 228-acre Tin Mountain Field Station in Jackson, NH. Tin Mountain manages 1,200 acres of forest land in Conway, NH to demonstrate sustainable forest management and to provide high-quality timber to local processing facilities. Throughout the school year, Tin Mountain provides environmental learning programs that are tailored to the individual curricula of participating schools. This sustained contact with school children over the entire academic year is a unique feature of Tin Mountain’s approach to environmental education. During the past school year, over 5,000 students and teachers in 16 schools in New Hampshire and Maine participated in the Center’s activities. Every summer, Tin Mountain operates camps for ages 4 to 16 in Fryeburg, ME and Albany, Jackson, South Conway, and South Tamworth, NH. 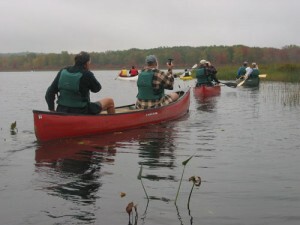 Younger children attend day camp, while a variety of weeklong ventures to wild areas in northern New England are offered to older age groups. Nearly 300 local children and families benefit each year from summer programs. For adults and families, Tin Mountain offers Community Nature Programs — a diverse array of over 70 programs each year that promote an appreciation of the environment in children, adults, and families. The series includes slide shows, hikes, lectures, and field trips featuring local natural history experts and the region’s spectacular natural areas, and sponsored by L.L. Bean and the Evenor Armington Fund. The staff at Tin Mountain consists of eight permanent employees: an executive director, education director, communication/PR manager, business manager, outreach coordinator, grounds/maintenance, and two teacher/naturalists. 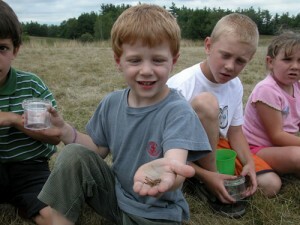 During the summer, 8-10 camp counselors are employed to assist with the increased workload of managing summer programs. In addition, numerous volunteers, many of them current or former schoolteachers, help with a variety of tasks associated with school programs, camps, and office chores. A 21-member volunteer Board of Trustees oversees finances, assists in fundraising, and sets overall policies which govern the organization. In addition to the annual fund drive, the Board coordinates three special fundraising events — the First Season Festival auction and dinner, the Mt. Washington Auto Road Bicycle Hillclimb and the Mt. Washington Century Ride. The Center is supported solely by charitable contributions and program fees.